After St. Columba, St. Fursey ( Furza) was the most famous Irish Saint on the continent and is especially remembered for his visions of heaven and hell that stirred all medieval Europe six centuries before Dante’s “Inferno”. He was born on the island of Inchaquinn at the end of the 6th century, became an abbot and founded the first monastery at Inchagoill, the largest island on the lake. However, on a pilgrimage to Rome he is credited with many miracles on his way through France. At Peronne (Picardy) he baptized the mayor’s son and deposited his precious relics of Patrick, Neldan and Beoladh in the local church of Mont des Cygnes where he often prayed. His pilgrimage to Rome accomplished, he returned to France and founded a monastery at Lagny en Brie, Paris, where news of the good deeds of the monks spread over all of France. St Bede described Fursey’s vision of heaven and hell, which he saw while in a trance, and afterwards he described the punishments that await sinners unless they repent. When Fursey died his body remained in an incorrupt state for four years while his tomb at his favourite church in Peronne was being prepared. 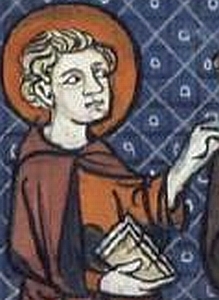 Louis IX in 1256 when he returned from the first crusade presented a rich shrine to hold the saint’s relics. Several chapels and wells keep his memory alive today in Picardy. His feast day is also celebrated in the diocese of Northampton, England, where he had briefly lived before his pilgrimage to Rome. St. Fursey is patron saint of Lough Corrib and also of the O’Fflahertie clann. This page was added on 09/12/2010.